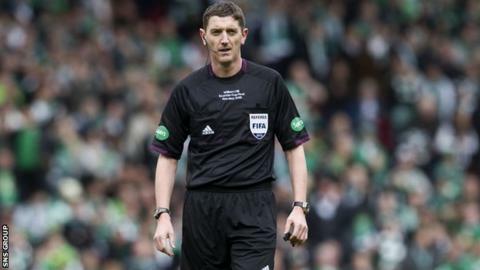 Referee Craig Thomson will oversee his third Scottish Cup final when St Johnstone meet Dundee United at Celtic Park next month. The 41-year-old was in charge for the finals in 2009 and 2012. He will be assisted by Graham Chambers and Michael Banks, while Stephen Finnie is the fourth official. The 17 May tie will have additional assistant referees for decision making in and around the penalty area - Kevin Clancy and Alan Muir.